I feel like when people think of bean dips, it’s easy to jump right to hummus. I always love a good hummus, and the occasional hot-cheesy hummus dip. However, I’ve found enjoyment in playing around with other beans for dips. My goal for holiday parties is to make food that feels indulgent but also has a side of healthy to it. 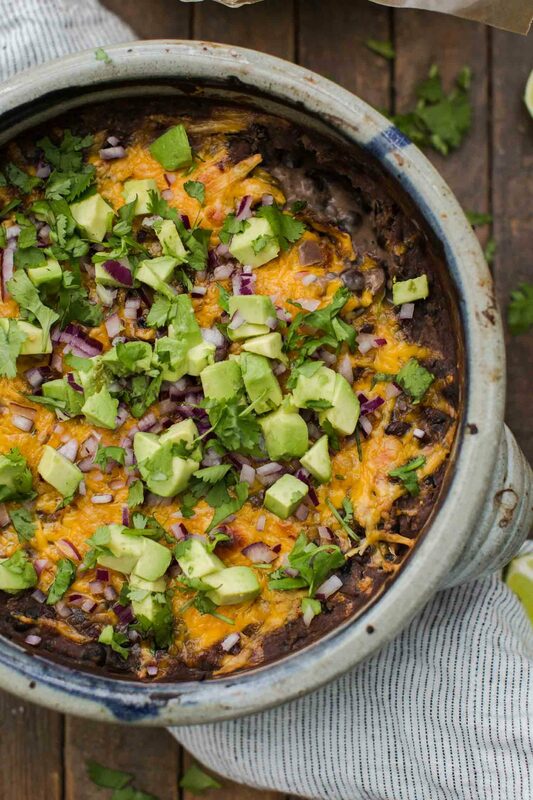 This black bean dip is heavy on the beans with a bit of cheese mixed in. Then I load it up with avocado, onions, and serve it with hot sauce. For me it’s the perfect holiday appetizer to please a crowd. 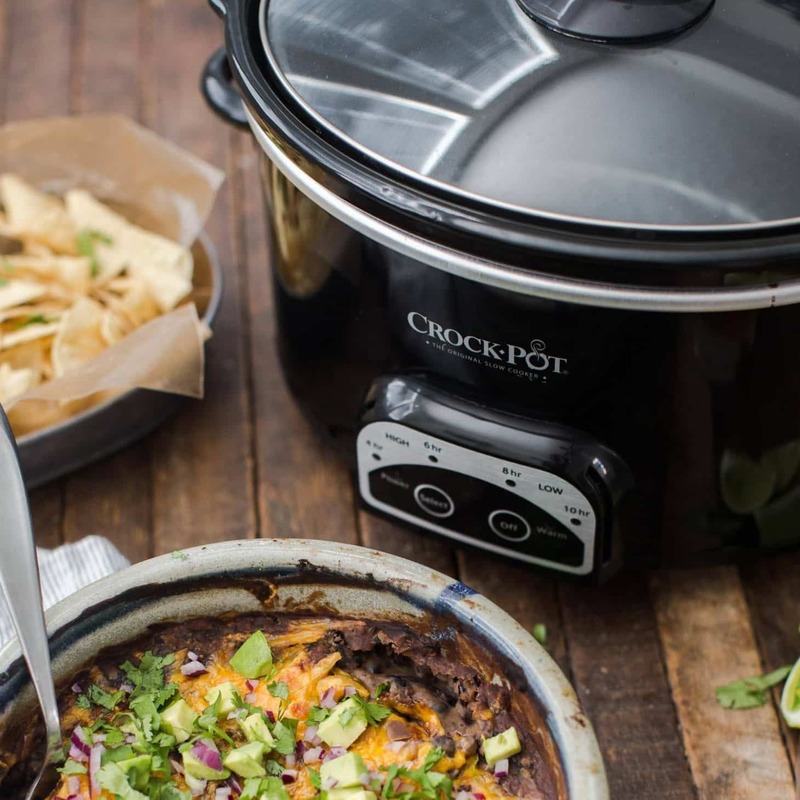 Best of all- everything is tossed in the Crock-Pot® slow cooker and left to cook until the beans are tender. 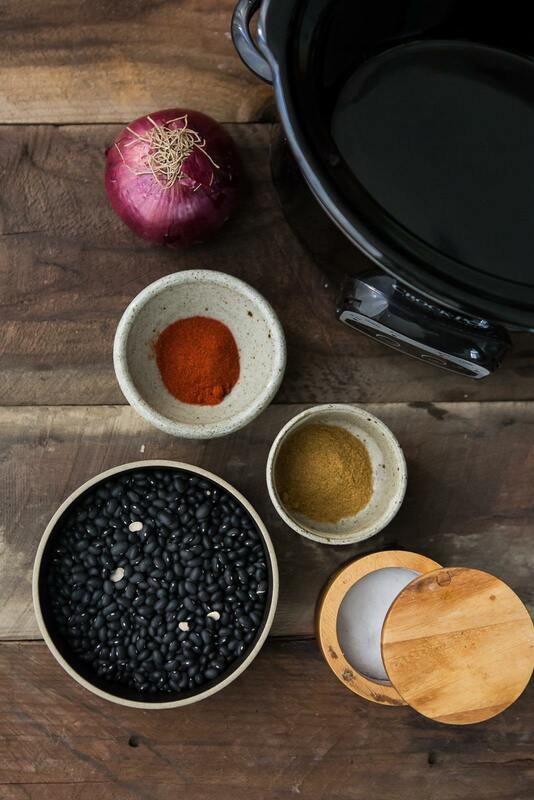 A perfect party appetizer for the holidays, this black bean dip lets the flavors develop in the Crockpot slow cooker and finished in the oven. 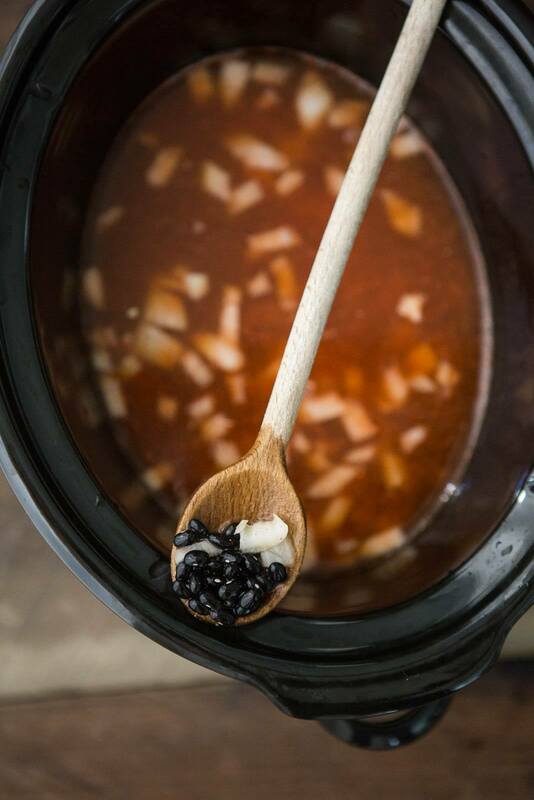 In a Crockpot Slow Cooker, combine the ingredients for the beans. Cover and turn on low. Let cook for 8 hours or until beans are tender. If liquid absorbs before the beans are soft, add 1 cup at a time until the beans are soft. Once beans are done, drain and reserve any extra liquid. Preheat oven to 400˚ F. Using a potato masher, mash the the beans until most of the beans are paste consistency but leaving a few bean pieces- the consistency is up to you- add leftover drained liquid as needed. Stir in the cream cheese and 2 ounces of cheddar cheese. Transfer to an 8×8 baking dish and cover with more cheese as desired. Transfer the baking dish to the oven and bake until the cheese is melted and slightly browning, 20 minutes. Place under the broiler to brown cheese faster, if desired. Serve the black bean dip with tortilla chips, sliced avocado, onions, tomatoes, more cheese, and/or salsa as desired. 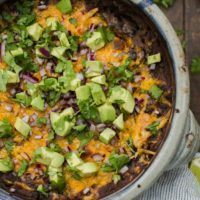 Tips & Tricks: If you’re not a fan of black beans, kidney or pinto beans would work well in this recipe. This black bean dip is one of the minimal ingredient recipes that can easily be adapted for whatever flavor profile you might like. However, my favorite, is making a big batch of these beans (without the cheese) and using them throughout the week for dinners! Vegan: Leave the cheese out of the black beans but puree part of the mixture to create a creamy texture then serve with a heavy drizzle of this butternut squash queso. Spicy: You could either add a pinch or two of cayenne to the beans or serve the black bean dip with a drizzle of your favorite hot sauce. 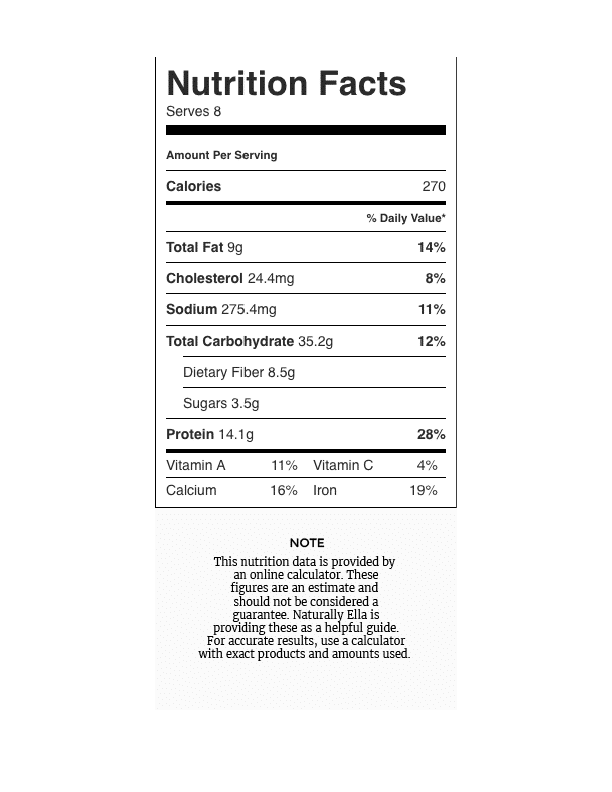 Other bean uses: These beans are delicious and can be used in so many ways outside of this black bean dip. I’ll save the beans (pre-cheese) to use in enchiladas, tacos, and rice bowls. My Crock-Pot® slow cooker is almost always on the counter during December. I’m starting meals so that we can have a hot meal with M gets home or I’m prepping something for a holiday party. It’s amazing how much time you can get back when you’re not worried at the last minute about what to bring to a party! Yum! This looks so inviting! It looks so good, I like black beans, I will try to cook this if i have time this weekend, thanks. This recipe looks awesome for the football playoffs coming up in January. I love that you made it using whole black beans!! Its always fun to have a variety of dip options when hosting people for games!! Love these flavors and that this is a slow cooker, “from scratch” recipe, thank you for sharing this! I have this in the slow cooker at the minute, hope it tastes as good as it looks and smells… I will keep you all posted. 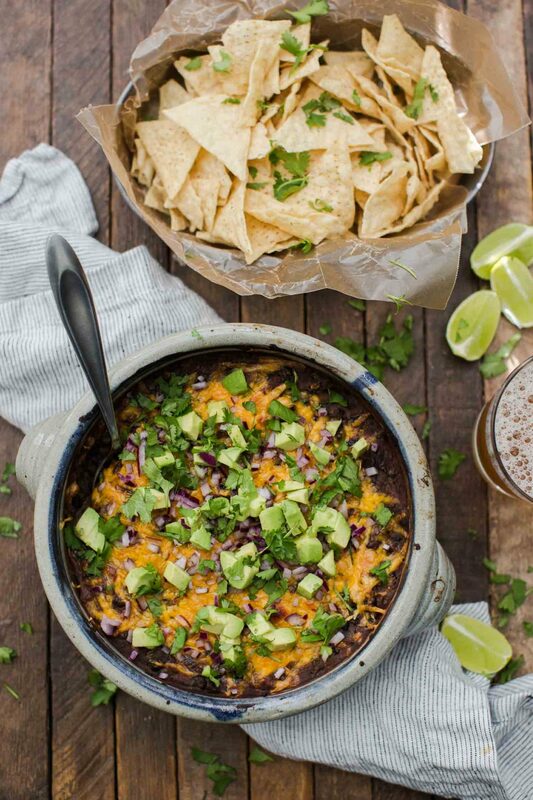 this dip is delicious – i added the juice of half a lime when i was mashing the beans – I also made a mistake and added the soft cheese and sharp cheddar to the slow cooker as I didnt read the full recipe properly. I also didnt bake it in the oven as I am trying to reduce calories – so over all the dip is really good. I will eat on a hot wholemeal pits.